Kobe Bryant announced that the Kobe and Vanessa Bryant Family Foundation has awarded a grant to the organization Step Up On Second to complete construction of eight permanent supportive housing units for homeless youth in Hollywood. “Los Angeles is the homeless capital of the country, and I am committed to doing what I can to change that statistic,” said Bryant. The eight youth housing units are part of the new Step Up On Vine building in Hollywood, the latest housing development of Step Up On Second, a local community agency serving over 1,800 individuals affected by mental illness. “We are incredibly grateful for the support of the Kobe and Vanessa Bryant Family Foundation in completing the construction of the new Step Up On Vine units,” said Tod Lipka, president and CEO of Step Up On Second. The Kobe and Vanessa Bryant Family Foundation’s newest initiative was unveiled Wednesday as part of an event celebrating the Foundation’s completed renovation of My Friend’s Place, a drop-in center for homeless youth in Hollywood. 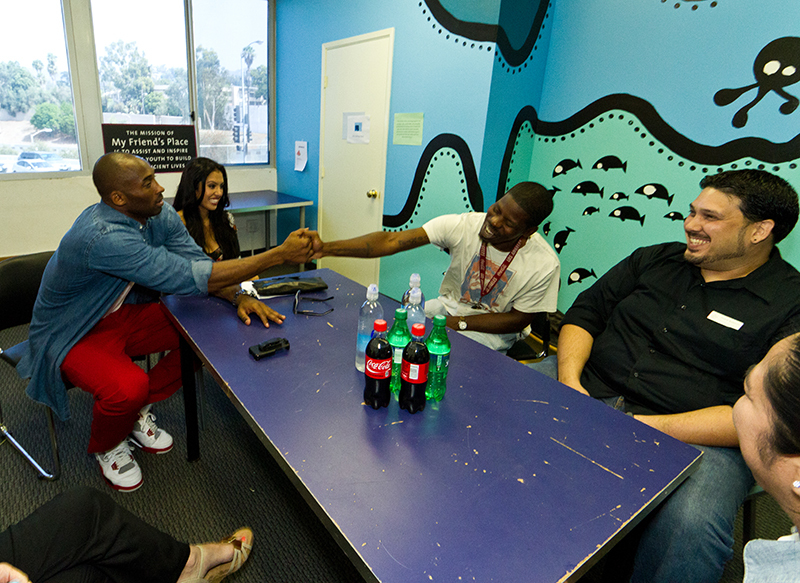 Kobe and Vanessa Bryant announced their support for My Friend’s Place earlier this year and funded building renovations for the organization which serves over 1,700 homeless youth ages 12 to 25 and their children each year. My Friend’s Place provides homeless youth with opportunities to improve their psychological, intellectual and physical capacity to reach their potential. It is estimated that over 4,000 homeless youth live in Los Angeles County. Los Angeles County Supervisor Zev Yaroslavsky also attended the event in support of Bryant and his Foundation’s efforts to fight homelessness in the region.